King of the gods Jupiter (not Ronald, although the two are often confused) explains home solar in ABC’s The Checkout. 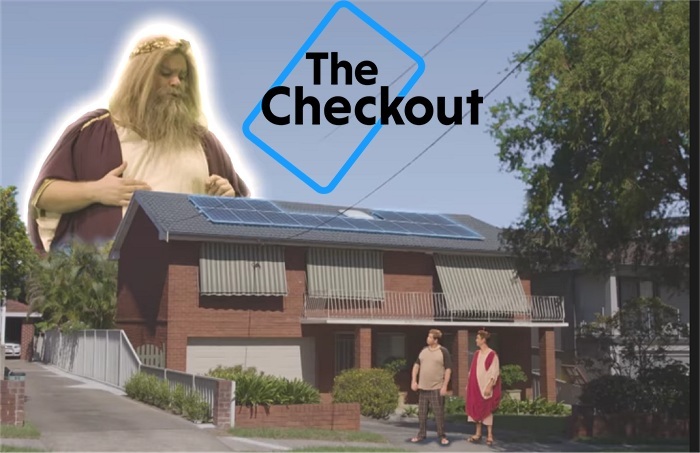 ABC’s The Checkout ran a jam-packed 10-minute segment on home solar power basics on Tuesday night, covering a broad range of topics – and SolarQuotes received a couple of mentions. While presented in a light-hearted way, as many of the program’s segments are, it contained a lot of important information that was delivered at a breakneck pace. 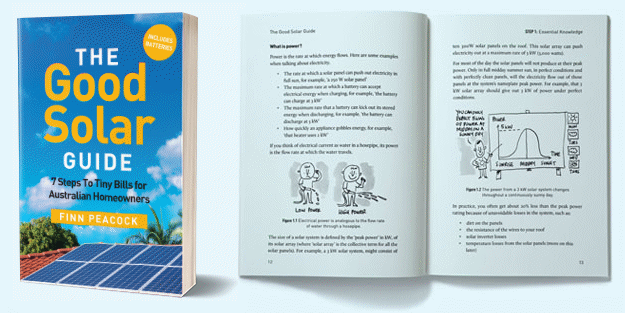 If you had a bit of trouble keeping up with it all, some of the major points it addressed and further reading on each are below – or you can also check out our home solar guide. Depending on where a system is installed in Australia and assuming a suitable installation scenario, The Checkout stated payback time can be anywhere from 3 – 10 years. SolarQuotes offers a detailed online solar calculator that shows you the cash flows, savings and financial payback you can expect if you invest in a solar power system. As for pricing, view some general information regarding how much solar panels cost here and some advice on system sizing here. Feed in tariffs provide a payment on the surplus electricity generated by solar panels not being used by the home that is exported to the mains grid. Learn more about feed in tariffs and the rates in your state. Australia’s major solar subsidy (often referred to as a rebate) is still alive and well, although it is being gradually phased out. The subsidy can knock thousands of dollars off the up-front cost of installing a system. With thousands of installers in Australia, finding the best one for your requirements can be a complex area, so these tips on choosing a solar installer may help – also check out SolarQuotes’ solar installer reviews. At the time of writing, the SQ database contained 28,108 reviews and ratings of 1,640 Australian solar installation companies – so whichever company you’re considering, you’ll likely find some details on the firm on this site. The Checkout segment also recommended using the SolarQuotes service (which is free) as a way to get quotes from pre-vetted installation companies – we put companies through the wringer so you don’t have to and match them to your requirements; saving you time and uncertainty. Probably the main takeaway from this part of the segment dealing with door-to-door system sales was “just don’t do it”. The Checkout team quoted the Consumer Action Law Centre, which states “unsolicited sale of solar panels is causing significant consumer harm”. More on the report that was drawn from can be viewed here. SQ blogger Ronald has also published a detail article concerning consumer rights and door-to-door solar sales. If you have recently signed a contract as a result of contact with a door-to-door PV purveyor and are now having second thoughts, remember you have a 10-day cooling off period (and that’s 10 business days). This is another complex area, but here are some tips on comparing solar panels and choosing a solar inverter. You can also check out SQ’s panel reviews and inverter reviews sections. These ratings and reviews have been provided by thousands of Australians who have had the components installed for at least 12 months. The Checkout segment mentioned various types of warranties associated with a solar power system, such as the installation (usually 5 years), solar panel (10 years/25 years) and inverter (5-10 years) warranty. This issue aside and as with everything else solar energy related, choosing a solid installation company that uses components produced by likewise solid companies is very important with regard to warranty. Depending on the situation, a long warranty may be of no use if a company goes belly up or simply vanishes, or could make lodging a claim and having it honoured far more onerous. Solar batteries can be a bit of a thorny issue here on SolarQuotes and the topic creates a lot of controversy. The Checkout refer to consumer advocacy group Choice, which states waiting until 2021 will see a substantial drop in battery prices. SQ founder Finn Peacock goes into more detail about aspects to consider if contemplating installing home batteries now in his recent article, The Six Biggest Myths About Battery Storage. Good follow-up! I saw the segment and agree that it was generally correct but glossed over a lot of details. Nice for SQ to get a little plug as well. Did you know that was coming? Finn had helped The Checkout team with some info, but the first we knew of the program going to air and the SQ mentions was after it happened. The temperature coefficient usually isn’t the most important variable to focus on unless you are in an area that gets extremely hot. This is because heat reduces the efficiency of your solar panels, making them operate at a reduced output.